The place where I spent my preteen to sixth form years has gained many loving nicknames in its time. The beginning of Sittingbourne, “sit”, can be made into an expletive with a simple addition of the letter H. But because I have been told to keep my pieces rated firmly PG, I shall merely be referring to it as the common “Sittingbum”. I moved to this place when I was eleven, starting secondary school with no friends and knowing nobody. A few awkward years passed and I managed to scrape together some sort of social life. But all of it was set around this town. This terrible, rotten town. Walking down the high street, the only thing I can see has changed in the four years I’ve been at uni is that there is now a Starbucks. This does not make it a classy town. It makes it the same place just with slightly better coffee. As I continue onwards, I am reminded of all the less-than-pleasant memories I amassed here. There’s a bin by which I ate a Greggs pasty and overheard a pair of men saying how they’d “smash my back-doors in”. Over there, I saw a man in a tracksuit hit his dog. Oh, look, the alley where my friend had racial abuse hurled at him. Buying my lighter seems to be the epitome of this place. I go into a card and party shop and they are the first thing on display. 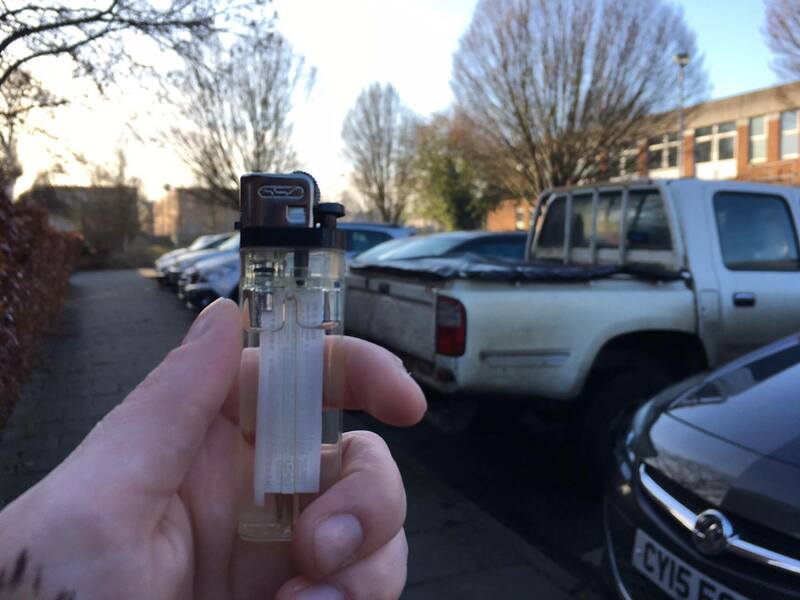 I pick out a clear lighter, like the feelings of nothingness I have towards this town. The sweet-looking old lady at the checkout gives a hacking cough and grunts “that’ll be 30p, babe.” I wish I could end this on a positive note, but it’s about to be 2017 and I’m filled with bitterness and rage. This is a place where I got an education, not a terrible one, but one where I definitely stopped feeling the motivation to care at around seventeen. There were some good times, like when on my 18th birthday I performed as Mrs Lovett in Sweeney Todd. But even then, they are tinged with acidity for one reason or another. I loved one thing about Sittingbum, and that was the people. Well; some of the people. I made some of my best friends there and the fact it was also where my family lived helped, but overall… don’t bother. Holly out. Have a good 2017, lads. You knew me Holly. And hey, look where we were before that….